Baloo would make a pretty good web designer – he would be in agreement with a lot of the things that Steve Krug, author of Don’t Make Me Think has to say about web design. 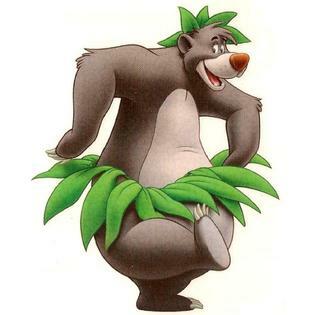 Keep it simple, don’t make people think – just stick to the bare necessities. What is the message that you are trying to communicate? It’s probably something simple right? You started your company to help people improve their nutrition, or you wanted to help people find the right home, or you want to provide a reliable recovery and towing service to help people out who are in a tight spot. The goal and purpose of your company is the thing that you should always have in mind and that is the thing that should be pushed. As long as you are focused on that aspect of your company the statistics will continue to go through the roof and you will expand. How does this tie into what you should want from your website? Well, people tend to over-complicate and over-think things – they build complexity into an activity where there doesn’t need to be any. If you are Mowgli, making everything more complicated for yourself and getting a fistful of prickles, then we are Baloo, come to show you how to pick the prickly pear. Web designers are there to make sure that when traffic comes onto your site the eye is directed to certain key aspects of the message that you want to convey. Your visitor needs to be able to see at a glance where every piece of information that they might need is located, so that if they don’t want to read the content, which a lot don’t, they can just point and click and get the data that they want. Some people are floating around, and some people are browsing with more intent, but both of them are going to be looking for similar signposts to let them know where they are and what’s available. To run with the prickly pear metaphor a little more – your website visitor wants to be able to pick that pear easily, and if what they get when they land on your site is a fist full of prickles, they are not going to stick around. What would constitute prickles? Overly busy design, colors that make it hard to read or unappealing, competing messages that jostle for attention, bad flows, and if they stay long enough … bad content. When you are navigating the internet jungle it is nice to have someone who knows the ropes traveling alongside you, because you can get into trouble. Why does it all seem so complicated? How can we cut through the vines and tangles and get you where you need to be? We have been doing this for a while, and we have worked with a lot of people to get their websites doing what they need them to do. Because we have navigated the terrain we can make it simple for you. Once we have helped you get those “bear necessities” firmly in place, you will see that we are the bees buzzin’ in the tree to make some honey just for you.